Carpe Diem Kombucha in a bottle. In my latest tea adventure in New York, I discovered that bottled cold tea is much more popular there than it is here. Most chiller cabinets in shops have both soft drinks and an assortment of drinks made from tea combined with other ingredients – even asparagus! Snapple – everybody drinks Snapple in the U.S., I observed – even has a range of white and green teas flavoured with all sorts, from flowers to honey. A New Yorker friend introduced me to the intriguing tea known as “Kombucha”. Initially, I thought she was referring to Konbu Tea (Japanese sea weed tea), a lovely, soothing drink tasting of the sea. 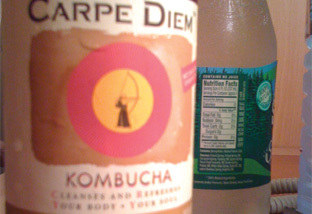 I discovered I was wrong when I bought one particular blend of Kombucha from Carpe Diem. This was light and slightly fizzy, with a hint of apple cider vinegar and various floral afternotes reminiscent of hibiscus and summer berries. It was not too sweet and, all in all, it was a very nice drink. Kombucha was first discovered during the Tsin dynasty (221 BC). Ever since, it has been part of the ancient Zen philosophy of life and valued for its harmonizing effect on body and soul. Kombucha is produced by fermentation using kombucha cultures and lactobacilli. Microorganism blend 0.5g containing Kombucha culture and Lactobacillus casei. Organic acids 0.5g consisting of lactic acid & acetic acid. 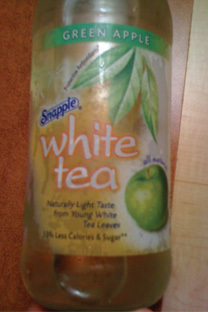 Snapple’s Green Apple White Tea tastes a bit too sweet, very little white tea flavour and a very synthetic green apple flavour. 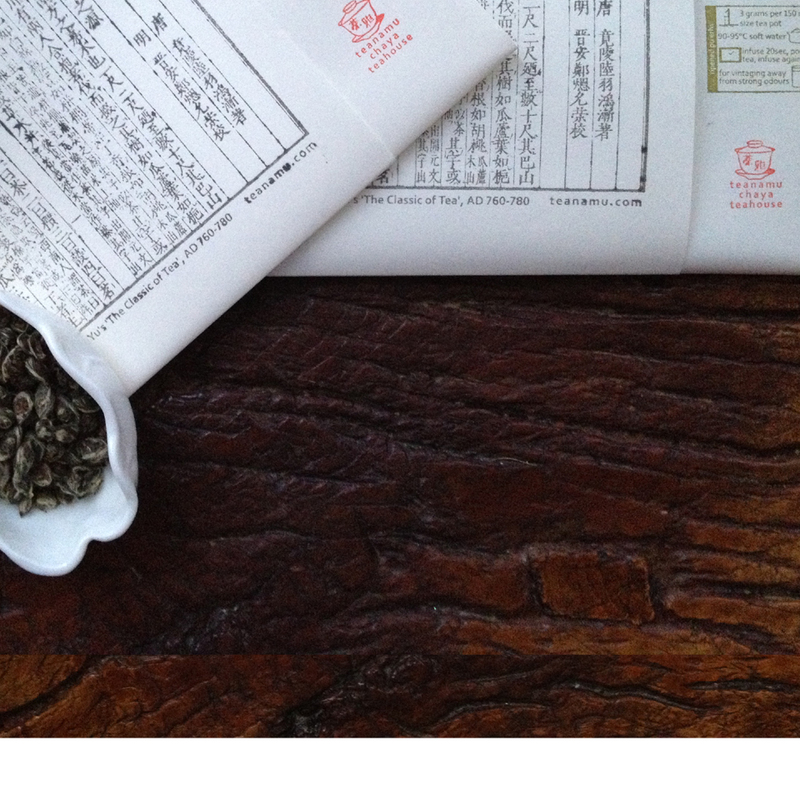 There are many claims of origin for this tea but it is thought the Chinese first discovered it. In Chinese kombucha is called hongchajun 红茶菌 (lit. “black tea fungus/mushroom”), hongchagu 红茶菇 (“black tea mushroom”), or chameijun 茶霉菌 (“tea mould”). In 1971 the tea was taken by a Japanese teacher to Japan and from there interest in kombucha spread to Russia and the States. Kombucha is said to balance the Yin and Yang elements in the body. It contains many different cultures along with several organic acids, active enzymes, amino acids, and polyphenols. It is believed by some to cleanse and strengthen the body as the kombucha culture turns tea and sugar into essential acids such as glucuronic acid useful for de-toxing and boosting the immune system, usinic acid which serves in cases of urea (gout) to rid the body of impurities, lactic acid essential for a healthy digestive tract and acetic acid useful as an antiseptic and for inhibiting harmful bacteria. It can also produce citric acid, malic acid, butyric acid, amino Acids and almost all the B complex vitamins. “Kombucha tea” is a drink of the living medium of the kombucha culture called “Mycoderma Aceti”. “Mycoderma” means skin fungus in Greek and “Aceti” relates to the acid created by the yeast. (These combined organisms are able to repel other moulds and bacteria over an extended period.). The mother culture looks a lot like a well risen pancake. Sweet tea is placed in a suitable container and the mother culture allowed to float in it. The sugar, tea and oxygen feed the culture, then the yeast and bacteria in the culture invade the nutrient solution to perform their separate functions. The purpose of the yeast is to convert the sugar in the tea to alcohol, which in turn is digested by the bacteria and converted into organic acids. Nutrients from the tea are absorbed by the culture, enabling it to produce a second culture on the surface of the brew, and to excrete minerals and vitamins into the beverage. You will need some wide-mouthed glass jars, kombucha culture, c.6 black or green tea bags, water (3 or 4 litre), sugar (240g brown or white), clean paper napkin or tea towel, rubber band or string, funnel, and cleaned and sterilized bottles. 1. Get kombucha starter culture. You can buy kombucha culture on the web (places to get kombucha culture). Often you’re only charged the P&P. The starter replicates itself in each batch, so one is enough for your lifetime. Soon you’ll have a culture for everyone you know! 2. Brew tea and sweeten. Make 3 to 4 litres of tea (use a muslin cloth). Cool to room temperature. Remove tea bags and add sugar. Don’t worry if it seems too sweet – the culture feeds on sugar and caffeine, so the final drink will not be as sweet as the original. If your culture came with some liquid, add the starter liquid to the cooled tea. Pour the sweet tea into your jar and add the culture. If it floats on top, it will grow another layer, which can be peeled off and used for another batch when the kombucha is ready. If it settles to the bottom, that’s fine – a new culture will form on top of the tea. The starter will grow to the diameter of your jar, so make sure the mouth is wide enough to remove it easily when you are done. Cover your jar with a clean towel and seal around the rim with a rubber band. Store in a spot out of direct sunlight for 7-14 days. The longer you leave your tea, the more sour it will become. Start tasting it after 5 or 6 days, and decant into clean plastic or glass soda bottles when you like the taste. 5. Give it some fizz. Tightly cap bottles and store in a warm place for another day or so until the plastic bottle hardens from pressure. Be aware that as the kombucha continues to ferment, the pressure inside the bottle is growing and can cause it to explode if left too long (this is more of a concern with glass bottles). If you’re worried, leave the cap a little loose, but this will prevent the tea from fizzing properly. 6. Drink and make more. Always set aside 10% of the liquid to help start future batches. Then you can start all over again! If you want a steady flow of “the tea of immortality,” then it probably makes sense to stagger your batches. Most experts warn against drinking too much of the stuff; it is a detoxifier, so you don’t want to stress out your body. As with all foods, be careful when preparing and storing kombucha. Make sure everything is clean and sterilized while preparing. If you see moulds, toss out the entire batch, including the starter. Key components of food safety when brewing kombucha include clean environment, proper temperature and low pH levels. I must admit that there is a bit of “yuck” factor for anyone reading this for the first time and not having tasted the tea drink. However, having drunk the beverage and having done some investigation into this tea, I found it a really pleasant drink. I shall get some kombucha culture soon and start off my own batch of kombucha. In the meantime, if you see this being sold in shops in the UK, do let me know! The key to making great Kombucha is to keep trying and stick with it until you’ve mastered the process in your own way. It also helps to add flavorings like fruit. The thing that I did not manage to find out in my research is whether one needs to keep the culture at a certain temperature range?